I lie long crest of this jay is composed mainly of two large feathers with their flat surfaces facing forward. The crest is often flicked up and down as the jay utters its calls, which include \\ histles and harsh, rattling cries. I .ike other birds of the crow family, it lacks a loud advertising song. 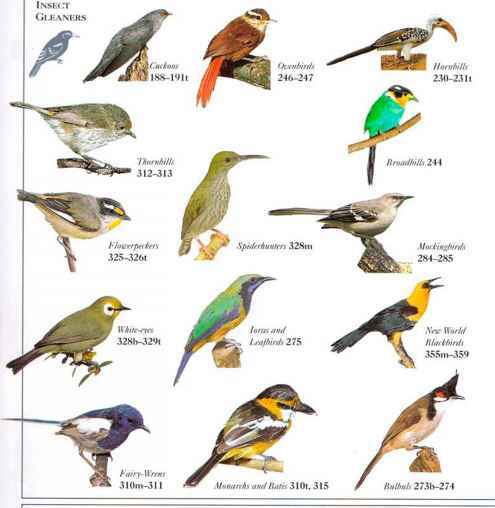 Inhabiting lowland rain forest and mountain forest lip to 2,500 ft (800 m), it usually forages in pairs or small parties. 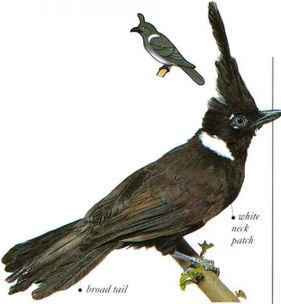 Uncommon and little studied despite its wide distribution, the Crested Jay seems to take only live food, including large insects such ; cockroaches and wasps, and other invertebrates such as millipedes. When approached, it is often surprisingly tame, possibly because in its remote habitat it is isolated from human contact. On occasion, however, ('rested Jays have been known to "mob" a human in the same w ay that small birds w ill mob a bird of prey. This may serve-to alert other birds as well as to drive the intruder away. • NliST A solid tw ig nest placed in a tree or tall sapling. • DISTRIBUTION S.li. Asia from S.W. Thailand to Borneo and Java.